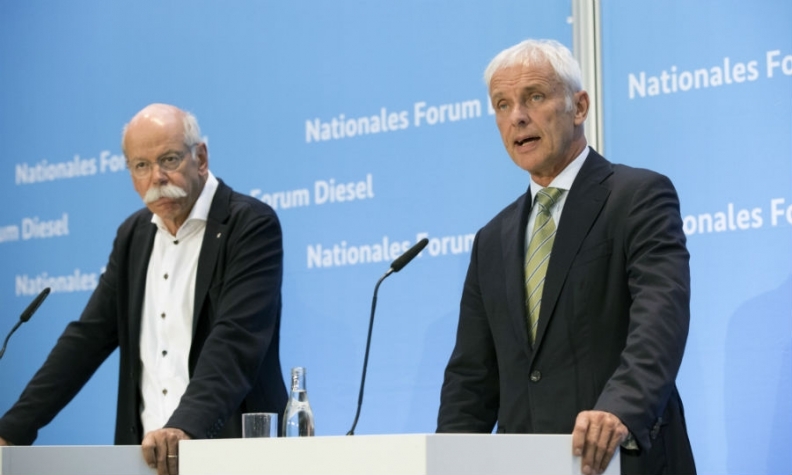 Daimler's Zetsche, left, and VW CEO Matthias Mueller speak at Germany's diesel forum Wednesday. BERLIN -- BMW, Daimler and Volkswagen Group agreed to to update the engine software of more than 5 million newer diesel cars in Germany to curb NOx emissions. They will also offer trade-in rebates on older models that cannot be updated. The deal avoids more costly remedies in a bid to salvage diesel technology and avoid driving bans in German cities. The recalls will cost about 500 million euros ($593 million) and largely sticks to commitments that the automakers had already made. The deal allows the companies to avoid costly mechanical modifications to engine and exhaust systems. About half the fixes have already been carried out as part of Volkswagen Group's response to its cheating scandal. The aim of the fixes to Euro 5 cars and some Euro 6 models is to cut NOx emissions by 25 percent to 30 percent on average, the VDA industry lobby said. 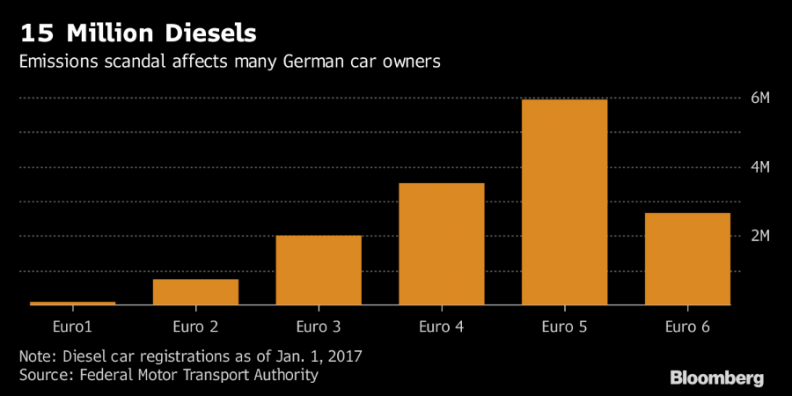 In addition, the costs of paying car owners incentives for trading in their older diesel cars for new models will far exceed 500 million euros for the three carmakers, the VDA said. The incentives are aimed at encouraging consumers to trade in older diesel cars that cannot be improved with software updates. While overall details of the scrappage plan were unavailable, BMW outlined plans to offer 2,000-euro trade-in bonuses. The deal came at a so-called "diesel summit" in Berlin on Wednesday between industry executives and automaker executives. Chancellor Angela Merkel's government has come under mounting pressure for not doing enough to crack down on vehicle pollution and for being too close to powerful automakers. The issue has become a central campaign topic ahead of next month's national election, prompting the government to summon car bosses to try to avert moves in some cities to force bans on diesel vehicles. "I understand that many people think that the German car industry is the problem," Daimler CEO Dieter Zetsche said in an emailed statement. "It’s our job to make clear that we’re part of the solution. German Justice Minister Heiko Maas said the agreement was only a first step, warning that bans on diesel vehicles could not be ruled out and urging automakers to focus more on consumers. "The legal requirements for clean air remain in effect," he told Thursday editions of Germany's daily newspaper Bild. Ministers have been wary of angering the owners of 15 million diesel vehicles and damaging an industry that is the country's biggest exporter and provides about 800,000 jobs. The DUH environmental group said the summit had failed as software updates would only result in a cut of about 2 percent to 3 percent of emissions of toxic NOx, adding it would pursue court cases for diesel bans in 16 cities. "Today's summit is bad news for hundred of thousands of people who will get sick and 10,600 who will die prematurely due to NOx each year," DUH head Juergen Resch said in a statement. The stakes have increased for German automakers in recent weeks. Britain and France have announced plans to eventually ban all diesel and gasoline vehicles and Tesla has launched its first mass-market electric car. Meanwhile, BMW, Daimler, Audi, Porsche and VW are being investigated by European regulators for alleged anti-competitive collusion. Evercore analyst Arndt Ellinghorst said the costs were manageable for the industry, but cautioned: "What the agreement doesn’t do is restore consumer confidence in diesel engines." German car sales data on Wednesday showed diesel car sales fell 12.7 percent in July. Now diesel makes up only 40.5 percent of new car sales in Europe's largest car market, down from 46 percent at the end last year.